WHY DOES THE SPOKANE PORTLAND & SEATTLE have a hold on me? I never saw it run -- I was born in it's last year of paper existence, with the Alco Centuries on the cusp of retirement. In my childhood, Oregon was a land of giants -- lumbering Burlington Northern, grimy Southern Pacific, and juggernaut Union Pacific. There was very little else. The past, to me, was a treasure box of lost knowledge, of greatness forgotten, beckoning me to dig it out. Out of this triumvirate of corporate coldness, imagine my surprise and pleasure to find that, once, the Northwest had a scrappy, proud railroad of it's own, a company that styled itself as "The Northwest's Own Railway." The slogan, which was coined by GM Ed Stanton in the 1950s, was so evocative, that a slightly modified version of it became the name of this web-zine. I fell in love with the railway, on sight, and was further surprised to learn that the BN secondary in my own hometown was once an SP&S subsidiary -- the Oregon Electric -- and had played host to Green and Gold Alcos just a few short years before I came into the world. It seemed destiny. THE SP&S WAS BUILT LATE. 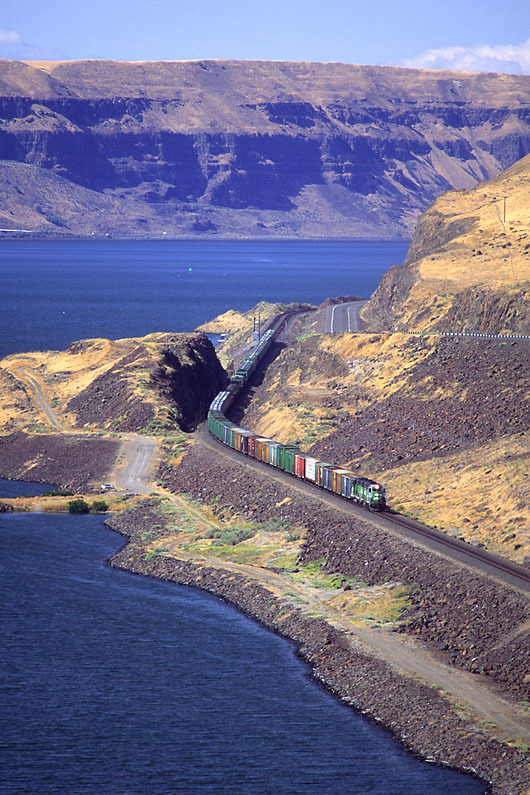 The North bank of the Columbia River was the last prime spot unused by railroads in the PNW, and the NP was determined to lay down a line along it to reach Portland more directly from the east. When the GN got in on the project, (adding a line from Pasco to Spokane in the process,) it was clear a joint company was needed, and thus, in the first decade of the 20th century, the company that would come to be called the SP&S was born. The line was very much tied to the charismatic James J. Hill, who used it as a staging point for a number of strategic pushes south, into Oregon, then largely a Harriman monopoly. His dream to reach California eventually came true, years after his death, when the GN extended off the SP&S subsidiary Oregon Trunk into Klamath Falls, and past to a connection with the Western Pacific at Beiber, in Northern California. TODAY, DESPITE THE RE-OPENING OF STAMPEDE, the ex SP&S, now known as the Fallbridge Sub, is the most important BNSF line in the region, handling almost all east-west general freight traffic. The number of trains on the Fallbridge Sub averages in the neighborhood of 30 per day. The Inside Gateway, which closed when UP and WP merged in 1981, is open for business again, with trackage rights and the purchase of the WP line from Beiber to Keddie attained from the UP+SP merger. On the branches, the decline of the resource based economy during the BN era took it's toll in the form of many abandonments, while cost cutting, suburban growth, and fire cut apart much of what remained. Recently, however, a resurgance has arrived, as shortline Portland & Western rehabilitated much of the United, A-Line, and the former OE. Indeed, this year, the Astoria Line is scheduled to see it's first regular passenger service in over fifty years, in time for the 2003-2005 Lewis & Clark Bicentenial, while the OE will see commute trains run on it's rails again from Beaverton to Wilsonville. Not all of the SP&S, however, has faired so well. The third sub, built largely for GN traffic from the main at Pasco into Spokane, was removed by BN as a cost cutting measure in the early nineties. It is now but a ghost of itself, a rail trail for horses and mountain bikes. The great viaducts high above the Snake -- crossing Burr, Box, and Bovey Canyons -- stand silent and alone. At set intervals, bald foundations litter the r-o-w, epitaths of the stations no longer served. And Spokane? The 1974 Expo so remade the town, that very little recognizable remains, except for the clocktower of the GN station, still standing in the riverside park, a finger of bothersome history in a postmodern city. Portland area resident Alexander Craghead is the Editor and Webmaster of NWOR. A member of the Spokane, Portland & Seattle Railway Historical Society, he can be reached at abcraghead@earthlink.net. Additionally, he would like to thank Chris Camp and Dan Schwanz for their help with this article.